Just like its name, the ping pong table does not consume your home space. It is a fold and store table. It is one of the most storable table tennis devices in the market. You will not worry about storage space. It is convenient for the household. The EastPoint Sports 15mm ping pong table is recommended for home and tournament competition. 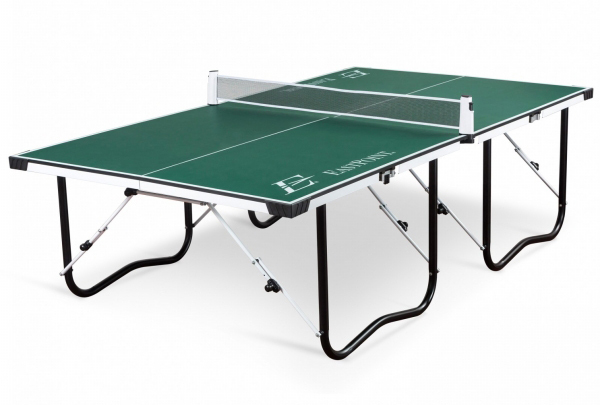 Below are excellent reasons why you should have this exceptional table tennis table. It is pre-assembled. The setup process is quick and time-saving. You do not have to spend too much time assembling its parts after purchase. The table is folded and placed in a box. You can just unfold it, stretch the stands, adjust the safety locks, turn over the two halves, fix the net and enjoy your play. You are always ready for ready for your in-house game or outdoor competition. It is small in size. The Fold-n-Store table is 9*5 ft. It is 108 x 30 x 60 inches in dimension and weighs 138 pounds. The playing surface is 15mm thick. Its size and weight make it storable and portable. After playing, it takes minutes to fold it and place it in the box. Its size is 85% less than conventional tables. You can quickly fold it, place it in the box and place it in the boot of your car. You can, therefore, have a competition anytime and anywhere. The attached rolling wheels and carry handles help in transportation. You can store it almost anywhere in your house. After folding it, you can place it under the bed or couch. You need not set up extra space. The ergonomic carry handles also assist in storage. It has a retractable net that prevents your balls from flying over. Also, it comes with a post system that helps players to set up the retractable table tennis net. The net is also portable, storable and compact. The playing surface is fully laminated. The laminating makes it durable and prevents it from stains, fading, scratches, and dents. The laminate surface makes the table attractive and easy to clean. Also, the table legs are coated with powder and made of steel. They are rust-resistant. The legs are also thick enough (38mm) to enhance support of the ping pong table. The newest version of the EastPoint 15mm Fold-n-Store table comes in 2 boxes. The first box has the pre-assembled folded ping-pong game, and the second contains the post system and the deluxe retractable net. The balls and paddles are purchased separately. However, they are available and affordable. The EastPoint Sports 15mm Fold-n-Store table is the best for players who like having indoor fun or take part in tournaments. It is affordable, durable, easy to transport, and offers satisfactory results. It does not consume storage space and is easy to assemble. The retractable net shields the balls from bouncing over. This superb table can never disappoint you. Get one and enjoy undisrupted table tennis game. You may get the ideas of different outdoor table tennis tables if you intend to get one in near future.